It rained most of the night and early in the morning, and there had been a bit of sunshine since then, but the weather seemed a bit unsure about what it wanted to do. 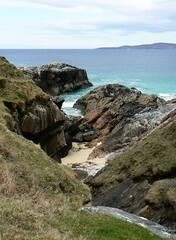 I chose a sunny moment to say my goodbyes to Laura and Jack, and head off through South Harris. The first six or seven miles were desolate, grassy and rocky. The map pointed out "South Harris Forest" to the north, but there wasn't a tree in sight. The road looped inland and emerged on the coast again at Luskentyre Beach, a vast expanse of fine white sand and quite a jaw-dropping sight as it first came into view between the bare hillsides. Beaches were the theme of the day after that, from the stunning clear turquoise sea at Seilebost through tiny rocky bays at Horgabost and Borve, to Scarista which is overlooked by a golf course. Thankfully the hills were a little kinder around there, although there was quite a big climb as the road changed direction south towards Leverburgh. It had turned into a sunny day and I rode north onto Berneray, which was so lovely and peaceful, the sun was out, nobody was around and seals were basking on the rocks. I made my way to Baile for the Gatliff hostel, following the tiny "Hostel" signs until the road turned into a field of sheep and I wondered whether I'd come to the right place. Several stone buildings stood in various states of repair and disrepair, with builders working on some of them. The builders said I should just pitch up and wait for the warden to come round later. I found a nice flat spot by the shore, full of sheep who soon scattered when it became apparent I was there to stay. 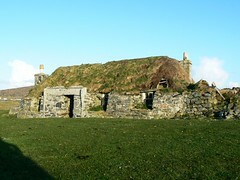 The nearest building was a derelict stone cottage with a grass roof but no roof-goats. It was a couple of miles ride back down the road to the nearest phone box as I couldn't get a mobile signal (Apparently not all networks are created equal, and on the Outer Hebrides most of them are greater than mine) I'd had quite a lovely day so for once was able to sound a bit more jolly on the phone to dgym. There were two others guests at the hostel. I was quite excited to see Mike's trike as it was exactly like dgym's and you don't see those too often. 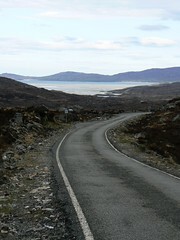 Mike was a Hebridean resident, living on Lewis and quite regularly cycling up and down the islands. 71-year-old Dave was not on a bike but a cycling enthusiast nonetheless. He had cycled in 84 out of the 86 counties, and firmly believed that riding a bicycle is the most fun that can possibly be had. He told us about a 1950's Claude Butler at home in need of repair. It sounded like a lovely bike and I told him he really should take it to a bike shop to get it fixed up. 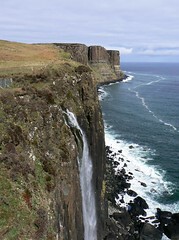 Wednesday April 30th - Fairy Glen and the edge of the world. The day started out beautifully, a few dark clouds that soon faded away. 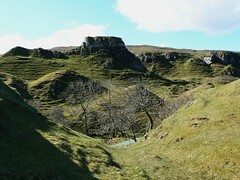 I had several hours to kill until the 2pm ferry, so left the tent behind and headed for Fairy Glen. Fairy Glen is one of those wonderful little secrets that you won't find signposted on marked on the map, I'd seen references to it on the internet with no real idea as to what was there, just talk of how magical it was. It was a few miles away from the town and I had to ride all the way around the bay, up a fair bit and then up a fair bit more after I'd turned off the main road. It was worth the climb. I reached the top of the hill to find myself looking down into a valley full of little natural hill formations covered in sheep. It was pretty unique, not a soul in sight, interesting scenery, beautiful day, nice sheep... but I didn't see any fairies. I returned to the campsite, showered (Scottish campsites are so much better than French ones when it comes to getting a decent hot shower and it's fair to say I probably smelled better on this trip than the last one) and packed away. I stopped at a cafe in town for all day breakfast (nothing special) and boarded the ferry. Sailing to the Outer Hebrides felt a bit like sailing to the edge of the world, or at least to a remote rocky outcrop on the edge of the Atlantic. As the bloke on the campsite had predicted the weather had cooled down and it was now becoming windy and overcast. At Tarbert I found a mobile signal for the first time since I'd arrived, so stopped to call dgym. As we spoke, raindrops started to fall. By the time I got off the phone, it was pouring. I had planned on getting to a campsite a few miles down the road but, as the Rock View Bunkhouse conveniently appeared as I rode through the town, I suddenly failed to see the point. I've never been convinced about hostels... well, I've only ever stayed in one and that was pretty awful but this one was OK. The kitchen facilites were a bit old and in some cases broken, and the decor a bit outdated, but didn't have bare electrical wires or things growing in the showers or even obnoxious Dutchmen making loud phonecalls at 2am. There were only two other guests that night, Laura and Jack, two travellers who had met up a couple of days previously. Both were getting around by public transport. Laura was born in the USA but had been travelling for 20 years. From what she said, I concluded she was in her fifties, although she looked much younger. She was a Muslim (although not born so) and her hijab had attracted mockery almost as soon as she set foot in Oban. She was hoping to reach Edinburgh the next evening, and going to Doncaster after that. Jack, an Aussie who I estimated to be in his late sixties, wasn't sure where he was off to next. I had sardines on toast for dinner, toast being a rare luxury for the regular camper. Somebody had left the toaster on one of the many "black" settings so I managed to smoke out the kitchen, conveniently not setting off the somewhat dubious smoke alarm. 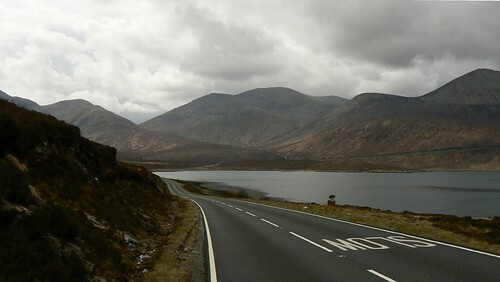 I started out on the A87 from Kyle of Lochalsh, over the bridge to Skye and then along the eastern coast towards Portree, the island's capital. Huge logging trucks thundered past on the single carriageway and I managed to scare the occasional sheep into running away from me - unfortunately when sheep run away, they often do so quite slowly in a straight line directly ahead of you, and are happy to do so for a considerable distance. After a couple of hours of weak sunshine, the weather took a turn for the greyer again. Curtains of white mist descended over the Cuillin hills, obscuring what would otherwise have been a wonderful view. As first days go, it could have been better. There's often a morale drop near the beginning of a tour, you wonder why you're doing what you're doing, you miss the comforts of home, and the distance yet to be covered is vast and intimidating, but it doesn't normally kick in on the first day. I reached Sligachan after 25 miles, damp and downhearted. There was a campsite by the loch, it was closed but there were four or five tents parked there anyway. I suppose with land access right being what they are in Scotland, a closed campsite just means closed facilities. I sat down in the doorway of the toilet block to shelter from the drizzle that had just started. The weather, the traffic and my own lack of fitness had been getting to me. After about 15 minutes I decided I'd had enough for the day so started testing various areas of campground for squishiness (result: mostly quite squishy). I'd just picked a slightly less squishy spot when I glanced up at the horizon and noticed a promising white light and hint of blue in the general direction of Portree. Hooray! Exactly the morale boost I needed. I abandoned my camp plans and set off again. 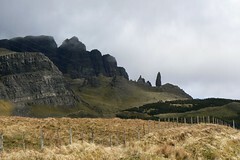 My legs were hurting but after a couple of miles it was downhill all the way to Portree, where I camped just beyond the town. Dinner was buttered macaroni and local smoked mackerel fried with onions, which was surprisingly tasty.